In the train, cinema found a technology to rival its own wonders, and early train films are often records of one modern technology marvelling at the other. Both inventions of the modern world they first met as the 19th century drew to a close at the infamous screening on the 28th December 1895 in Paris hosted by the Lumiere Brothers. What happened when they projected their film “L’Arrivee d’un train en gare de La Ciotat” is one of the founding legends of film-history. Since then the two technologies have run on parallel lines. 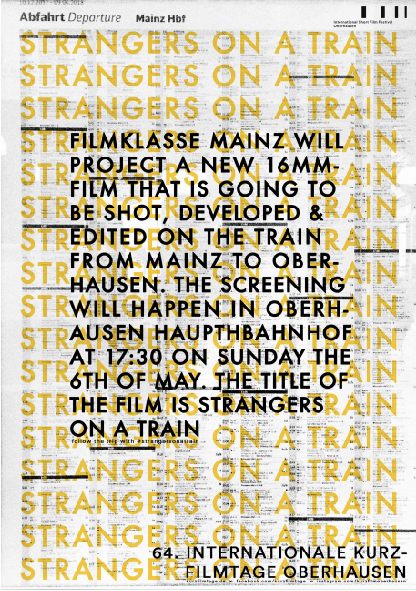 The Filmklasse Mainz’s new film, Strangers on a Train, that is going to premiere at the Oberhausen filmfestival, will through one single train journey activate the parallel histories of cinema & trains. Working along the boundaries and possibilities of celluloid film the class will shoot, develop and edit the film on the train during a one-day-journey from Mainz to Oberhausen. As they arrive in Oberhausen the film will be ready to be projected. The venture consists of boarding the train leaving Mainz HBF early in the morning and while travelling north shooting the film (on black and white 16mm film). The whole class taking turns shooting their own film within the film it will create an Exquisite Corpse of sorts. On the train the film will be processed, reversed from negative to positive, dried and spliced together so that when arriving in Oberhausen after a day on the tracks there will be a finished film ready to project at the festival. The Filmklasse guest Daniel Voigt aka Sicsic Tapes will join us on our trip to do field recordings and tape loops to be played live accompanying and expanding on the film.